Andrew Balding's Tullius ran out a comfortable winner of the bet365 Mile in soft ground at Sandown under Jimmy Fortune. Runner-up in the Lincoln on his seasonal debut, Andrew Balding's six-year-old was tucked in just off the pace set by 2012 winner Penitent in the Group Two contest. Jimmy Fortune, who was completing a double after taking the opener on What About Carlo, produced Tullius (9-2) to lead just inside the final furlong and he drew away to win by three and three-quarter lengths from Montiridge. Penitent was third, with both Top Notch Tonto and the well-backed 5-2 favourite Garswood never getting into a challenging position. Fortune said: "He's a very good horse when he gets the conditions. He loves the ground and loved the track. They went a good gallop, he cruised round there and won with a fair bit in hand. My only fear was getting to the front too early. "It's a very good training performance. He ran an absolute blinder in the Lincoln off a big weight. He's fit and he's well and in top form." 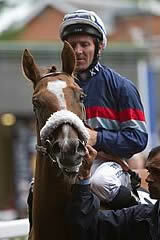 Balding added: "He was a high-class horse two years ago, very progressive, and won a Group Three at Salisbury nicely. Sadly, he got an injury at the end of that year and it took all of last year to get him right, but his run in the Lincoln was very good and he was entitled to come on for it. "There were a lot of soft-ground horses in the race, but some of them didn't have that advantage of having had a run and I think that's significant at this time of year. "We took a punt and speculated a few quid giving him entries in the Lockinge Stakes and the Queen Anne Stakes and he's going to have to take one of those up, if we get the ground. With a Group Two penalty now for the rest of the year he's going to have to take on better horses. "It's fantastic prize-money at that (Group One) level. Not that he'll probably win any of those, but hopefully he might pick up some decent place money."